In 1992, Dr. Michael Quinn published an essay stating that women have priesthood, and have held the priesthood since 1843. It was one of the reasons church leaders cited in excommunicating him. This will be an interesting contrast to our conversation with Dr. Jonathan Stapley, who did not endorse the idea that women held priesthood. Both Stapley agree that women don’t hold priesthood office, but Quinn is bolder in his claims than Stapley. Michael: Women receive priesthood when it’s conferred on them in the endowment, and I think that men do too, but they’ve already received it. They’ve received it separately as young men as 12-year-olds to prepare them for the endowment. Women don’t need that kind of preparation. They are already spiritually endowed. GT: At least that is the stereotypical thinking. Michael: That’s the stereotypical view. And I’m willing to adopt that because it’s convenient to help people understand this issue that women have a preparation that is separate for the endowment than men do. Jonathan: there’s no question that men and women have equal access to the power of God. So, women are recognized healers, for example. They participate in the healing liturgy. Women perform anointings, and they seal anointings and they heal the sick and bless for comfort from the earliest days. Joseph Smith says this is of course, entirely appropriate activity for the Relief Society sisters to participate in, any women. Every church president after that says it’s fine. So this is a manifestation of God’s power. I would say that women receive liturgical authority to perform those acts, but Joseph Smith never characterizes that as priesthood. I asked Quinn what he thought about the Ordain Women movement. GT: Ok, so what do you think about Kate Kelly’s movement with Ordain Women? Michael: I understand it. I don’t support it. GT: You don’t support it? Michael: No, I understand it and I don’t think it’s necessary for women to be ordained to an appendage. Michael: Women don’t need an appendage to have the priesthood. GT: They’ve already got the priesthood. Michael: They’ve got the priesthood. GT: But what about the idea, why couldn’t a woman become a bishop? Lead a congregation? Michael: If those who preside over the appendages of these offices, which is what the president of the church does, he’s the president of the high priesthood. He could change that. This was a fantastic conversation, and I hope you check it out! Dr. Michael Quinn says women hold priesthood through the temple endowment. 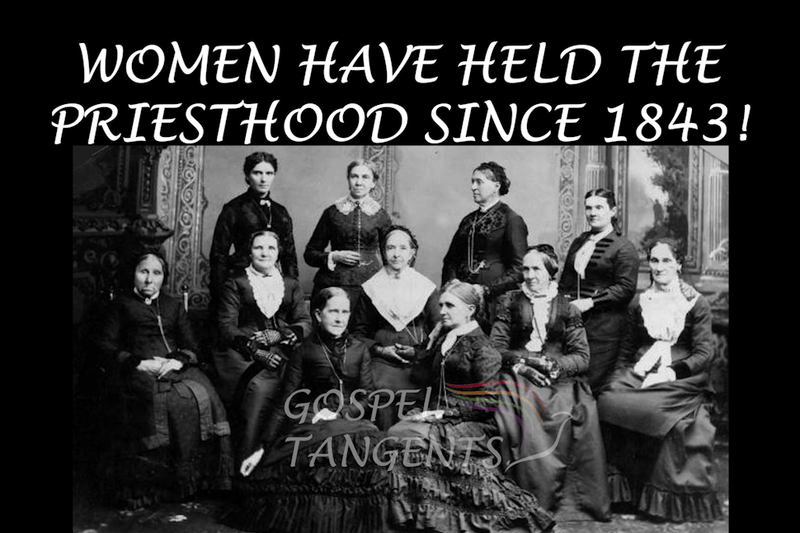 Women have priesthood since 1843! Don’t miss our other conversations with Dr. Quinn….